Highly recommended - worth every cent! Dr. Richards' 'Overcoming Social Anxiety' is a simple, easy to follow guide to (a) better understand what social anxiety is and (b) learning strategies to overcome it. Since I purchased the book, I have learnt so much more about myself and this devastating condition that has greatly affected my life for most of my life. Dr. Richards' explanations of the causes of social anxiety and his tried and tested strategies to overcome social anxiety are fairly easy to learn and practice, and they have proved to work or me. They have even 'spilled-over' and benefited other aspects of my life. Social anxiety is a terrible condition that no one deserves to live with. Dr. Richards' therapy is the best way that I have encountered to overcome it. I have found Dr. Richards' program to be positively phenomenal and truly transformational. I can't say high enough praise about Dr. Richards and the Social Anxiety Institute. I am so excited about this new workbook which will accompany the new audio and video series. It is chocked full of nuggets and gems. Each handout is enormously helpful and practical. It is solid, evidence-based therapy -- Comprehensive Cognitive Behavioral Therapy -- which has been demonstrated to be the treatment of choice for Social Anxiety Disorder. I have just started leading my first group for treatment of Social Anxiety Disorder, based on Dr. Richards' audio series and workbook. Each of my clients have found the concepts and handouts to be tremendously helpful. Each week, they look forward to the new handouts. Each strategy builds upon the previous strategy in a systematic way. Dr. Richards gently encourages and challenges everyone to take steps towards overcoming Social Anxiety Disorder. Through this program, clients' confidence soars, and they are able to approach situations that were previously avoided like the plague. Pearls of great wisdom are in this program and in this workbook. This work comes highly recommended for clinicians and clients alike. I can't recommend this book and Dr. Richard's therapy enough. I had purchased other "hierarchy" workbook type books and the suggestions were not realistic to me and my brain. Not to mention visits to therapists who did not understand my anxiety. As you will learn, Dr. Richards fully understands Social Anxiety. Once I began Dr. Richard's therapy, I was able to understand why i was so uncomfortable in so many situations. That understanding was helpful by itself. The therapy explains how to realistically change the way you think and ultimately feel better by gaining strength and confidence. If you have Social Anxiety, this workbook will speak to you. I highly recommend the entire program, but to be able to obtain the workbook for this price is truly an affordable first step to releasing the boat anchor that is Social Anxiety. I'm convinced the best place/treatment for Social Anxiety in the ENTIRE WORLD is Dr. Richard's Social Anxiety Institute. 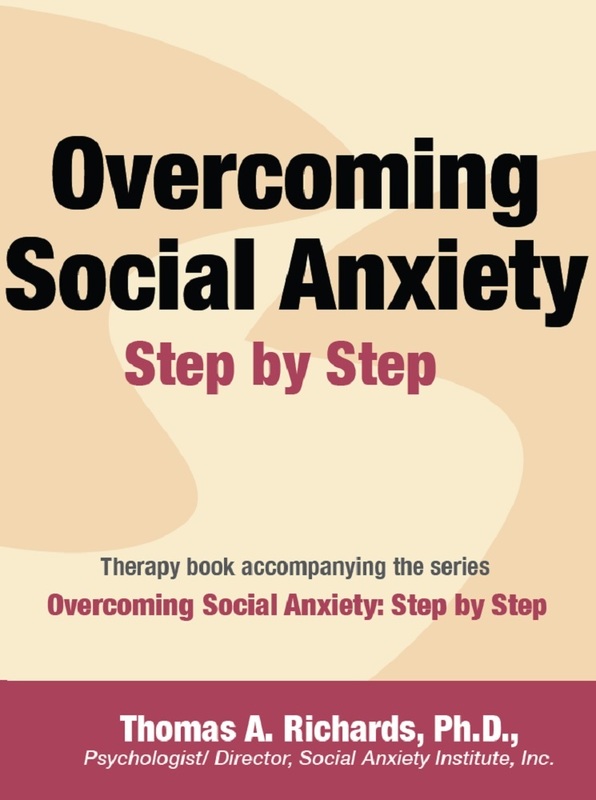 I have used these handouts successfully to overcome social anxiety and I would highly encourage people who suffer from the horrors of SA to consider purchasing this workbook which works in association with the audio series. It is based on legitimate science backed comprehensive cognitive behavioural theory and benefits are felt immediately through the practice of the strategies. To overcome completely requires the consistent practice of these strategies over time but it is well worth the effort rather than continue to live with the tremendous pain of being trapped in SA. I'm truly grateful for this resource and strongly urge people with debilitating social anxiety to pursue this for themselves. These are the handouts that go along with the new audio/video series "Overcoming Social Anxiety: Step by Step". This series has helped tens of thousands of people make progress and overcome social anxiety. Dr. Richards is perhaps the best known and leading psychologist when it comes to understanding social anxiety disorder. He has worked with thousands of people over the past twenty+ years. Each of these handouts is a (cognitive) strategy that gives the reader a clearly defined strategy they can use to lessen and reduce social anxiety. It is an upgrade -- with additional materials -- of the current workbook that has been used since 2000. I have never seen another program as concise, direct, and geared toward practical application. Dr. Richards approaches overcoming social anxiety from the standpoint that each person can gently and slowly learn new cognitive and behavioral strategies that will help them gradually get over the horrors of social anxiety disorder. This is the best workbook on social anxiety on the market. Ten stars! If you want to OVERCOME social anxiety and not just get informed about it, then this is the workbook for you. Everything is directed toward helping you overcome social anxiety disorder.